Today I’ve invited novelist, Richard H. Hardy to join me on Ascroft, eh? 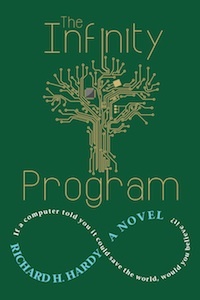 to answer a few questions about his recently released novel, The Infinity Program. Welcome Richard. Let’s get started, shall we? RH: The discovery of an alien quantum computer disrupts the lives of Harry Sale, Jon Graeme, and Lettie Olson. As Harry Sale cracks the alien code, his breakthroughs threaten to bring havoc to the rest of the world. Both Jon and Lettie pay a big price for Harry’s discoveries. Under the very noses of those who are trying to stop him, Harry forges ahead, trying to unleash a technological singularity. But one big question remains: Is Harry programming the computer or is the computer programming him? RH: There are actually a number of different themes woven into the fabric of The Infinity Program: the individual versus the society; the importance of addressing major environmental problems; the decimation of the Earth’s natural resources; and the plight of women at male-dominated IT companies. These are all issues I have given a lot of thought to over the years. I think environmental concerns are fundamental to our survival as a species. RH: I did quite a bit of research for The Infinity Program. I read many articles and books on quantum computers, hyper-computers, and cryptography. I also did a little reading about the Theory of Numbers. But readers need not be concerned about all the technicalities—in The Infinity Program it’s the story that counts. RH: I worked at a High-Tech company for over 26 years. I tried to give a truthful account of the peculiar environment of an IT company. Some aspects of my story, in particular the sexual harassment of Lettie, were based on accounts given to me by women who had worked at large IT companies in Boston and New York City. RH: Writing about women is much more of a challenge to me. I found as I wrote the book that I had a lot to learn. Fortunately, some women along the way, including my wife and my editors at Camel Press, helped me get on track when I fell short. I would have to say I prefer to write about women characters although I find it very challenging. Thanks for answering my questions, Richard. You’ve given me glimpses into the IT world and made me curious. 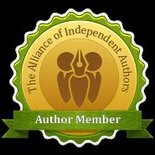 Readers who are equally curious can find Richard on his website, Facebook and Goodreads pages and The Infinity Program on its Goodreads page and retail sites, including Amazon and Smashwords. About Richard H. Hardy: He was born in Glasgow, Scotland, during a week of relentless bombing raids just before the close of World War II. The day he was born an incendiary bomb fell on the church across the street from where he lived, so he is fond of saying that he entered the world with a big adrenaline rush. His family later moved to England and then on to America. This entry was posted in October 2014 and tagged fiction, Richard H. Hardy, The Infinity Program. Bookmark the permalink. Dianne, thanks for hosting Richard for such an informative interview about writing! Thanks so much for featuring my Post about The Infinity Program!